I haven't had much time to write in my blog since I took over as President of PSBA, but I think about writing all the time. Sometimes I start and stop because I don't have time to finish, either way I keep hoping to find some time somewhere. I'll do that tomorrow... right? I'm having a moment of feeling caught up (don't worry it won't last). Despite the late start to the season the flow has been really good this year and I've been hearing from people they have been picking up a lot of swarms. This includes packages and even swarms picked up less than two months ago that are already trying for another round. It's especially important to continue to check hives every 7-10 days to keep the broodnest open. We all must work together to prevent swarms and keep bees from becoming a public nuisance. While our summer is just starting this is also the time of year to start thinking about how you are going to prepare your hives for winter. In just a months time, hives will start raising winter bees and you want to make sure those bees are well fed and in the best health possible. We are now at a tipping point where hives must start to decline to conserve resources which makes them more susceptible to climbing mite levels. One option is to think about creating a brood break, and to replace a package or old queen with a young queen having locally adapted genetics. A mistake that is often made is waiting too long to replace a queen with local genetics. If you are replacing genetics you need to allow enough time for the new queen to turnover the hive to her genetics in time for those bees to raise winter bees. Unfortunately even with the best genetics you still need to stay on top of the mite levels and be prepared to take steps to knock the levels down when needed. Those are the things I'm thinking about and hopefully now you are as well. 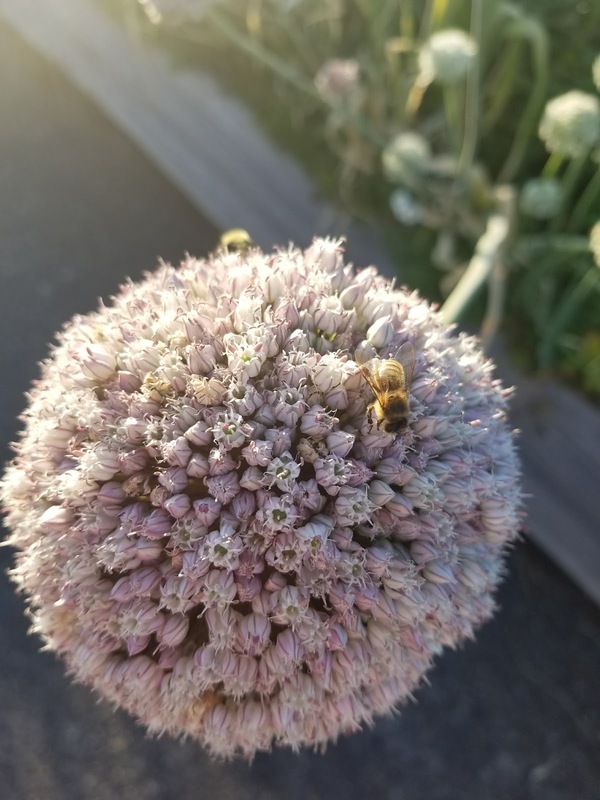 The bees are always planning a season ahead, so don't loose track of that now that our beautiful Seattle summer weather has arrived. 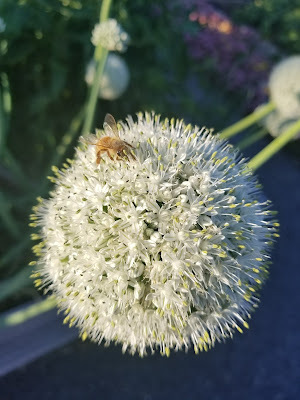 Quick cell shot of the girls all over Onion flowers just before sunset today.